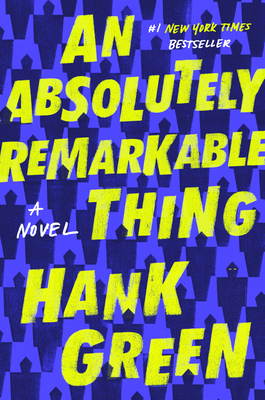 An Absolutely Remarkable Thing: A Novel (Hardcover) | Fountain Bookstore, Inc.
April May leaves her job in the middle of the night to discover a large transformer-like robot sculpture outside a Chipotle in Manhattan (one that I have happened to enjoy many burritos at). She calls her friend Andy and they make a video about it, naming him Carl (Wow, this really is a book for me, isn't it???). When she wakes up, she has become an internet sensation as she learns that these "Carls" have simultaneously appeared in over 60 cities around the world. When it turns out that the Carls may very likely be aliens, April May finds herself as a tier 5 celebrity, and the public quickly becomes polarized over whether the Carls pose a threat to humanity or an opportunity to work together to solve a complex puzzle. A critique on the current political and social climate, Green brilliantly depicts how quickly internet culture can tear apart the world it was built to connect. This debut is funny, snarky, intense and smart and I had a lot of fun reading it.